For most artists, evolution is a basic part of a career. There's a fine line between sounding the same as before, and adding new elements to further your own unique sound. Give fans more of the same and they lose interest, or change too much and see them walk away. 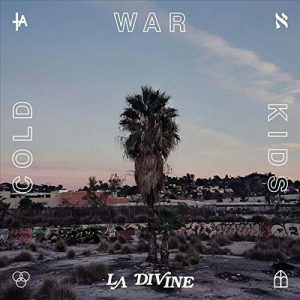 On their sixth album, L.A. Divine, Cold War Kids' biggest issue is that they continue to sound like themselves. Lyrically the album seems to traffic a bit too much in clichÃ©s and metaphors. The album opens with the lead single "Love is Mystical," which brings the symbolism of love breaking chains and light showing a way in the dark. It's set to a fun and familiar melody, helping to excuse the jumbled lyrics. This is not to say there aren't breakout songs on the album. The second track "Can We Hang On?" reminisces about the past and reflects on failures and triumphs. It's a song that blends the band's signature piano and guitar duets while letting frontman Nathan Willett's tenor vocals shine the way the fan base would want. "No Reason to Run" is a fun, uplifting and catchy song from the first note to the abrupt and finely-timed ending. Some of the lyrics get a bit jumbled, referencing Cro-Magnon men leaving their cave and fish growing legs to walk on land. As the song approaches the end, the rest of the band sings along, "So in love, so alive, no reason to run," in a harmony that truly highlight this as the feel-good song of the album. According to the band, L.A. Divine was written as a "tribute to Los Angeles and all its strange glory." The only time this is abundantly clear is on the song "L.A. River." At just over a minute, it features a murkiness not unlike the L.A. River itself. "Wilshire Protest" tries to be a spoken word, slam poetry taking a stand against injustices, but the effort mostly falls flat. Throughout the rest of the album, the band continues to sound like they always have, falling short of the artistic line. Instead of pushing the envelope and building upon past albums, Cold War Kids continue to sound like a tribute to the sound they've already perfected. Cold War Kids return to Philly on September 15th at Festival Pier alongside Young the Giant.